One of the first and now most frequently appearing of the beers from the Boatrocker barrel beer program is this take on the Berliner Weisse style. The beer begins with a sour mash whereby the grains are left in the mash tun over a day or more to allow natural lactic acids to develop before the brewing process recommences. When it's then been through the kettle, the wort is put into former Chardonnay barrels where it is inoculated with more bugs so that more sour characteristics can develop. 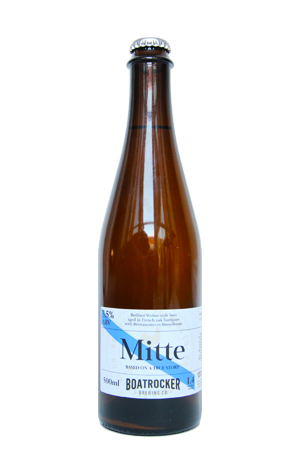 Once finished, Boatrocker's take on the rare German style pours a cloudy, pale straw colour and has the gentlest of carbonation. The aromas and flavours hint at the original occupant of the barrel, while the lactic sourness is present but not overbearing. The result is a light and refreshing drink with a touch of acidic lemon about it and a soft mouthfeel. Tipping the scales at just 3.5 percent it's also become a popular drop with designated drivers looking for an interesting, flavoursome drop since debuting at a Good Beer Showcase in late 2013. As of 2016, it's part of the brewery's barrel-aged 500ml bottle range.